ARC Wireless Solutions, Inc., formerly known as Antennas America, Inc., was founded in 1987. They are a publicly traded company on the NASDAQ exchange using the stock symbol "ARCW". Nestled in the foothills of the Rocky Mountains, ARC Wireless Solutions, Inc. is involved in selective designing, manufacturing, marketing and selling of a broad range of wireless components and network products and accessories. 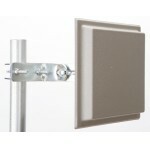 We stock their Integrated Enclosures, Integrated Antennas, Standalone Panel Antennas and replacement parts. GAS-P-3038-01 Rubber Gasket - Seal Enclosure to Antenna - ARC Wireless ARC-EP1000S01 N Hole Metal Plug with Gasket and Nut - ARC Wireless ARC Wireless 2.4 to 2.5GHz at 16dBi Standalone Panel Antenna with N-female jack and mounting bracket kit (BRA-A-1699-02). ARC Wireless 3.65GHz at 20dBi IES Panel Antenna with R/A SMA-female jack ARC Wireless 5.1 to 5.9GHz 20dBi Standalone Panel Antenna with N-female jack and mounting bracket kit (BRA-A-1699-02). ARC Wireless 2.1 to 2.9GHz at 18-14.5dBi Standalone Variable Degree V Pol Wideband Sector Antenna with N-female jack - New!